Located on the Turkish Riviera, Antalya is Turkey’s largest international sea resort. For the history enthusiast, this part of the country is particularly rich in ancient ruins and historic areas. The hotels in Antalya vary in the facilities that they offer as well as their rates. You can take your pick from the amazing 5 star hotels in Antalya, apartments for rent or cheap hotels in Antalya, Turkey. Even the best hotels in Antalya can’t keep their guests indoors for long. There are just so many amazing things to see and experience that visitors rarely spend much time in their rooms, suites or apartments in Antalya, Turkey. Termessos and the Güllük Dagi National Park are just 34 kilometres from Antalya. Due to its somewhat more remote location, this is one of the most well-preserved ancient ruins sites in Turkey and certainly worth visiting. Travelling to Hierapolis & Pamukkale will take between 2 and 3 hours by bus but it is really a fantastic trip. Apart from the ruins themselves, there are also museums, swimming facilities and so much more. Perge is another popular site where tourists enjoy visiting the beautiful ruins. This was once the location of one of the most prosperous cities of its time and visitors can get a close look an amphitheatre and the Hellenistic Gate. For an in depth look at the fascinating local history, make sure that you visit the Antalya Archaeological Museum. It offers a range of artefacts and exhibits that start at prehistoric times to more modern times. This is the perfect place to visit with the whole family. For golfing enthusiasts or even if you just enjoy the occasional game to help you relax, you will be pleased to know that there are a number of courses in the area. Take your pick and get away from it all for at least half a day, whilst staying at one of the resorts in Antalya, Turkey. If you enjoy the tranquillity of nature and waterfalls in particular, there are a few places you should visit. 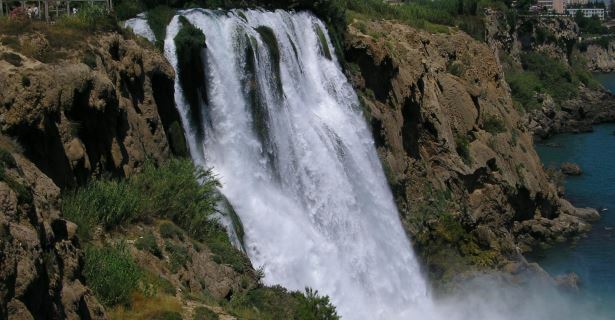 The Duden Waterfalls and the Kursunlu Waterfalls are two of the top rated falls in the area. A relaxing walk along the Antalya Marina is another popular activity for both tourists and the locals. Watching the water and looking at all the boats as the come and go is a lovely way to relax. The various forms of hotel accommodation in Antalya make it easy for tourists to find the best hotel according to their budget and preferences. When trying to decide just where to stay in Antalya, remember that online accommodation bookings can make a huge difference on your pocket and holiday budget. By booking a hotel in Antalya Turkey online, visitors can make the most of online discounts, specials and great deals.